What makes KDV Asserring so special? 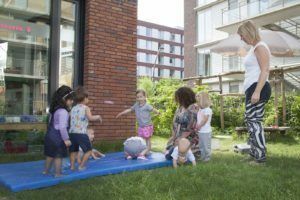 The nursery is located in the south Amstelveen in the Westwijk district, close to the shopping centre, the library and the schools. Asserring nursery is in a pleasant, light building with large group rooms, a main hall, a studio, and a large garden. The building also houses after school care and a playgroup. We work intensively with the after school care centre. We both use the outdoor area and older toddlers can pop into the ASC to see what it’s like before they start school. And vice versa, the children at the ASC sometimes pop into the nursery to, for instance, read a book with the children or put on a special performance – it’s a real treat! Asserring Nursery has a baby group and toddler group, and three vertical groups. The care of my child is good at KinderRijk Asserring. I have one suggestion regarding the food. I think it will be a good idea to have warm meals. Kids will enjoy eating with each other and learn as well.